Scotland is going through something of a boom period for independent music. Guitar based music and electronica especially are doing pretty well. One less publicised, yet vibrant part of the Scottish music scene is hip-hop. Edinburgh based Profisee recently released an excellent album and fellow capital rappers Madhat McGore and Silvertongue have been gaining momentum, while over in Glasgow Loki, Rustie and Hudson Mowhawke have been active on the scene and creating something of a buzz. 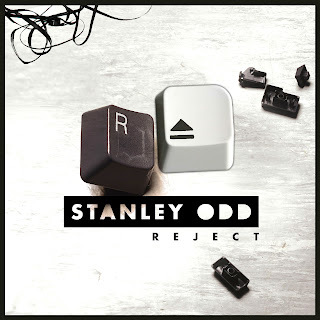 Back in the capital and Stanley Odd have gained a following and had favourable reaction to their debut album 'Oddio', which was released back in 2010. Several high profile support slots and many festivals appearances later and the band are getting ready to unleash album number two 'Reject' on the public. 'THIS IS STANLEY ODD' kicks things off with a steady, booming beat with some light and unobtrusive percussion sitting in the background. The rap flows nicely and it's quite good hearing some Scots words in there like "spraffing" and "daftie". There's nice flourishes sprinkled all over the backing music, delivered by live instrumentation as well as the usual samples and loops associated with the genre. The tempo is nice and steady. There's even a name check for De La Soul. Best of all though is the first letter of each line spells "THIS IS STANLEY ODD". All in all a good opening. There's a big beat on the intro to 'Antiheroics' too. Again it's steady as she goes for the tempo and the flashes of colour from the loops and samples are good. The socio-political lyrics are delivered in a steady, tight flow. This is an examination of Britain, the Big Brother state and even goes as far as Palestine and the Occupy Movement. It's writing of a Chuck D scale and like some of the best hip-hop it's cerebral, politically aware, paranoid, revolutionary and most of all, it's just great writing. 'Will The Last One Out Please Turn Off The Light' lays on the vocals from the outset. The tempo is high and on occasion the female vocal joins the main vocal, but for me it's strongest on the verses, when it's the main vocal only. Again the sense of non-conforming, anti-establishment themes is strong. 'Killergram' opens with a mad piano and a background hiss before the beat kicks in. The rhyme delivery is tight again and so far on this album, that's one consistent feature that has been excellent. Considering this is hip-hop that's no bad thing. There's a guitar coming through in places near the end but this track didn't feel as strong overall as some of it's predecessors. 'Going Through The Motions' opens with sounds sweeping back and forth, while a staggered beat comes in. This change from a regular beat makes the track quite interesting and the sound is fuller when the female vocal comes in, backed by a big bass sound that vibrates away underneath before the song strays into electronica. 'Join The Club' feels more like my kind of hip-hop. I grew up on a diet of Public Enemy, NWA, EPMD and Run DMC and others from this era. I like my beats old school and this track leans more towards this end of the hip-hop spectrum. Here, the beat is accompanied by a very nice piano and together, these elements make this my favourite beat of the album so far. I did feel like the female vocal took me out of the song a little bit, but this could be my bias towards the more traditional beats I mentioned. I am conscious that hip-hop has moved on much quicker than I have so nobody should take my griping about the vocal too seriously. There's also the fact the track name checks just about every pub and club in Edinburgh, which is like a stagger down memeory lane. 'Carry Me Home' feels like a folk song when it starts. Piano and strings are in the mix and it all sits together really well. When the rap comes in it's delivered really well, as you come to expect by now, but the clash of styles is perhaps a bit too much. When the beat kicks in though, the track picks up and for the last 90 seconds or so my enjoyment of the song did turn around. The lead single from the album is up next. 'Get Out Ma Headspace'is all loops and bloops and bleeps and samples at the outset, before a great, up tempo beat kicks in. Lyrically, it's a song I can relate to. Anyone who's had to sit at work and hear people discuss plotlines to Eastenders, or the latest Big Brother evictee will appreciate what Stanley Odd are saying here. This time I won't complain about female vocal parts. I liked it here. Everything just clicks on this track and I liked it a lot. 'The Councillor's Waiting Room' is an short instrumental that is actually quite warm and funky. It leads into 'Marriage Counselling', which comes at you immediately with a rhyme, followed by a really good beat and a fuzzy bass sound. The whole track is another really well written song, this time a metaphor about Scotland and England's relationship. One interesting aspect to the lyrics, is that it's told from both sides of the "marriage". As you may expect from a Scottish band there's plenty of perceived ills at the hands of England but the band look in the mirror and tell the other side of the story and the song feels mature and better for it. The penultimate track is 'I Don't Believe You'. This was another that just didn't click for me. The beat at the outset is slow and steady, while another distorted beat sits above. There are drums and piano in the mix too but it all feels a bit of a mixed bag and I never felt the song flowed smoothly at any point. 'Day 3', however, felt like one of the standout tracks of the album. There's a nice vocal to open the song, with a sad piano and some mournful notes for company. Grimey bass notes begin to appear, while the percussion is almost on the edge of hearing, but giving the feeling that's it's getting ever closer. The drums signal the start of the rap and the beat is really good. Lyrically, the song is about a girl, but it's lyrically very good and full of heart and emotion, while it's also musically excellent. Definitely another of the standout tracks of the album. This is a record that's not without it's peaks and troughs. There are many more peaks than troughs though. There's is an interesting approach to hip-hop. The live instrumentation works really well, but occassionally there seems to be a little too much happening that doesn't quite gel together. Now and then there are vocal parts that don't feel like they belong in the particular song, but then on another song the parts fit better and the vocal shines. Lyrically, it's unquestionably excellent. The songs display social awareness, a political consciousness and a down to earth, day to day feel to them that can only be had by great writing. This for me is where this album is at it's strongest. If you like hip-hop this is definitely worth your time. It's not a classic, but it is pretty good and with that writing ability these guys have a good future ahead of them. 'Reject' is released on 17th September and can be ordered from the Stanley Odd Big Cartel page. The band also have several live dates coming up, which are listed below. Ticket links can be found on the Stanley Odd website.